Some of the stock in our Studio. 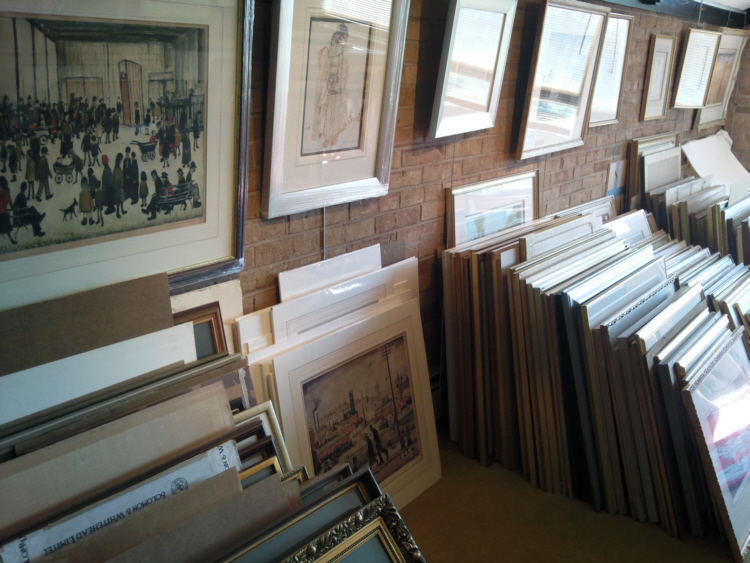 For almost thirty years, Lowry.co.uk has been dealing in fine original works of art by renowned British artists. We have gained an invaluable knowledge, which we can hopefully pass on to our clients. Having started from a small shop outside Nottingham, (the rent was twenty pounds a week...!). We sold a general selection of art and offered a picture framing service. The frames at that time were all cut by hand and left in clamps overnight. Very different from the electronic machinery used today. Business progressed and so did our knowledge of the art world and it's most sought after artists. Relocating to a gallery in the city, was the start of many exhibitions with some of the country's finest artists in attendance, David Shepherd, Gordon King. The next development was to move into a large gallery in the city centre of Nottingham. This transition, although an enormous undertaking and a large financial commitment was a tremendous success, as we were the only Gallery in the city to be offering high quality collectable art by world renowned artists. Customer service has always been an imporant priority. The gallery was sold to one of the country's leading publishing companies, who wished to have a 'flagship' gallery in the UK. The sale presented an excellent opportunity to offer via the internet, a service to both the trade and retail where one could purchase original paintings and signed, limited edition prints by the finest most highly regarded artists at excellent prices. We are considered experts in the work of:- L.S. Lowry, David Shepherd, and Sir William Russell Flint. Holding large stocks of their work, and supplying clients throughout the UK, and worldwide. Clients can be assured in the knowledge that the work we purchase and sell is of the best possible condition and we personally guarantee the authenticity and condition of all the work for sale. If you wish to visit the studio, please call us, or we can always arrange a viewing in your area.